Christy Ziglar, mother of twins and successful author, knows the value of imparting important life lessons to children in everyday contexts. As a Certified Financial Planner professional, she spent a decade working as a financial advisor helping individuals progress towards their financial goals. She also understands the value of money: "I was fortunate to grow up not wanting for things, but we were still taught that life is full of trade-offs and 'too expensive' meant just that," she told me. A graduate of Duke University, Ziglar returned to her native Atlanta after successful experiences with start-ups during Silicon Valley's halcyon days. Her entrepreneurial spirit would serve her well many times over. Ziglar, the niece of legendary motivator and optimist, the late Zig Ziglar, wanted to combine her professional interest in finance with her desire to help people. She became the Atlanta spokesperson for A.G. Edwards' (now Wells Fargo Advisors) national "Nestegg for Knowledge" program in 2007 and helped develop a financial literacy program for first and second graders with The Children's Museum of Atlanta. Ziglar was hooked. "That was when I first became aware of the huge need to teach children the ability to think beyond the moment and to make better choices in general," she told me. She explained, "In our digital consumer age where everything seems to be instant gratification and on-demand, it's more difficult than ever for children to learn patience and how to stay focused on the things that matter most." Ziglar turned to writing, and the result has been the national attention-getting series, Shine Bright Kids (Ideals Books), beautifully illustrated by Luanne Marten. Her first book, Can't-Wait Willow!, imparts a key life lesson: saving for something you really want--in Willow's case, admission to the circus--while saying "no" to other things along the way. Delayed gratification. In Ziglar's second book, Must-Have Marvin!, dedicated to her late uncle, young Marvin learns the hard way that his friends are far more important than his desire for things. As Ziglar puts it wisely, "You can have lots of stuff, but it will never be enough. Instead make lots of friends, and you'll be happy in the end." What do Willow and Marvin have in common? They learn from their mistakes--temptation and focusing on "getting" to the exclusion of friends, respectively--just like the rest of us, young and old. 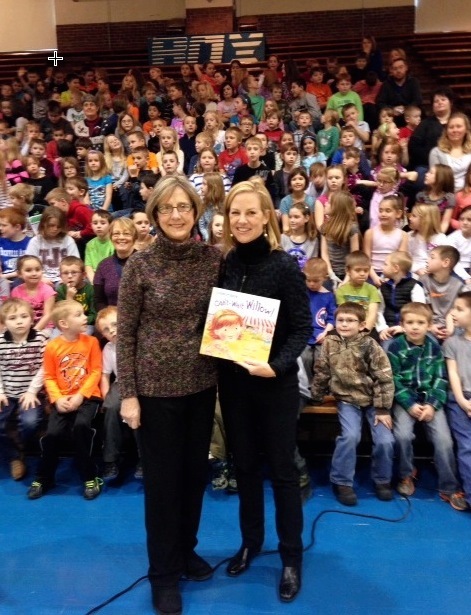 Ziglar succeeds at imparting mature character lessons in a kid-friendly way. In addition, Ziggle, a yellow star playfully hidden within the illustrations, serves as a modern Jiminy Cricket and visibly changes moods depending on the choices that Willow and Marvin make. Kids love the interactivity and grown-ups appreciate the teachable moments. Ziglar makes clear that Ziggle himself had to learn how to make better choices. She writes on her website: "Did you know there was a time when Ziggle didn't know who he was or what he was good at?" The result is understated, warm learning and a great opportunity for child-parent discussion. Ziglar hinted that a book for younger kids that focuses exclusively on the star may be coming soon. Willow and Marvin will soon have new friends. Whatever-Wanda! will be the third book in the series. "Wanda needs a serious attitude adjustment," Ziglar told me, and she'll get it in early 2015, when Shine Bright Kids plans to launch a smartphone app, as well as additional activity books. The series' website currently offer several free worksheets, as well as a Learning to Shine activity book. Other characters on the way will continue their predecessors' tradition of imparting indispensable life lessons such as learning to be content; personal responsibility; perseverance; and doing your best. In the meantime, Ziglar is speaking to large groups of children and adults nationally about these very values. With the holiday season around the corner, impulse control and delayed gratification will be difficult for adults and children alike. When stuffing your stockings, Can't-Wait Willow! and Must-Have Marvin! are sure to bring fun and wisdom for all ages. Christy Ziglar speaks to an elementary school in Parke County, Indiana.